Having missing teeth can cause a decline in your cosmetic appearance, oral health, and supporting bone structures. At Smiles by Design, we provide beautiful, natural, and functional dentures to restore a patient’s ability to perform everyday activities such as eating and speaking. Dr. David A. Boone formulizes treatment plans based on an individual’s dental needs, whether they require partial, immediate, or replacement single arch or full arch dentures. Patients missing one or more teeth utilize partials to complete their smiles. Metal clasps are attached to surrounding teeth to ensure the removable prosthetic is secured. Partials are made from durable and sturdy material to restore your cosmetic appearance and provide you with an improved bite and smile! If a patient requires extraction of one or more teeth prior to being fitted for dentures, and chooses not to wait for the surrounding tissues to heal (usually for cosmetic purposes) immediate dentures may be recommended. Once the denture is provided, the patient must plan to wear their appliance 24 hours a day for up to four months or until the soft tissues have healed. You are then scheduled for a follow-up visit to re-line your current dentures, as there may be some changes to hard and soft tissues through the healing process, after extraction. During traditional denture processes, any remaining teeth are extracted, and gum tissues are given a chance to heal for about 8 weeks before impressions are taken and your new denture is placed. Routine examinations are provided to make sure your appliance fits comfortably. Dental implants provide a stable foundation for dentures. Appliances retained by implants maintain jawbone density and are less likely to need adjustments over time. To be a viable candidate you must have sufficient supporting bone structure. If you meet the necessary requirements, this may be an option for you! Over time, the hard and soft tissues in your mouth change, which may cause a loose-fitting denture. 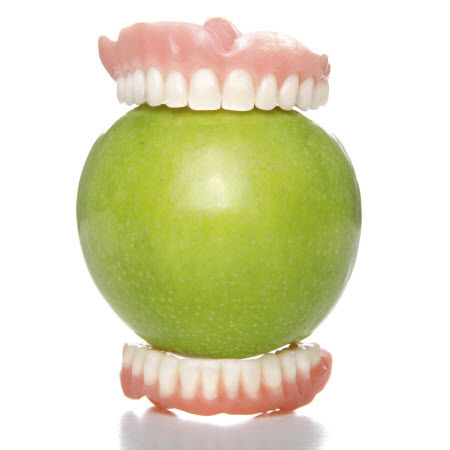 Often times, a denture reline is possible, as opposed to the need for a completely new set of dentures. Our dental lab provides same-day denture reline service for our denture patients. Dr. Boone and his team at Smiles by Design strive to meet patients’ dental goals by providing comprehensive family and cosmetic services. For more information about dentures, contact our Grand Rapids practice today!